It is pretty obvious that Germans Attic wanted to really push forward their concept of mysticism and horror, but how one comes up with the name Attic for a metal band, that is a bit unclear. As if “in horror movies something strange always comes down from the attic, so let’s just call our band that”? Plausible, but only the musicians themselves could answer with certainty. In order to speak of distressing and terrifying concepts, there are of course many ways. Perhaps Attic songwriters retrieved a CD or two from King Diamond’s earlier period from their upper floor storage space which inspired the moniker. But it is absolutely definite that The Invocation is dusted off Danish sensation worship. I have no idea if any of my suppositions are true or not, but after the church organ intro of The Hidden Grave Funeral in the Woods arrives announced with Meister Cagliostro’s falsetto, and the comparisons to the Abigail masterpiece are on full display, down to the vocalist enunciation of “rest in peace” and razory dual guitars delivering hooks galore. Of course, it is not the 7th day of July 1777, nor is it 1986, but nowadays are just as good for this style of heavy metal/NWOBHM in Attic’s hands. If you ever hated King Diamond’s falsetto, then The Invocation is just not for you, as Meister Cagliostro uses his highest vocal timbre throughout, to the point of abusing it at the expense of more needed power in the lower register. The hooks and the galloping riffs from the opening one-two punch of Funeral in the Woods and Join the Coven start running together a bit by the middle of the album, so Attic does well to slow things down on Edlyn rolling those heavier boulder-like riffs. In the Chapel is another organ church service announcing the second half of The Invocation, after which the title song gets things more on track, with Meister Cagliostro switching to falsetto most incessantly. The Headless Horseman gives homage to another band Attic doesn’t mind to be compared to, the mighty Judas Priest. The way the melodic leads flow, the final scream, but mostly how the words “headless rider” are pronounced just breathes Nightcrawler. The closer Evil Inheritance tends to go more epic with a mid-way darker rolling acoustic threat, a welcome respite from the prior gallops. 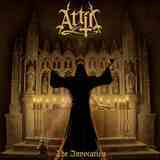 If Mercyful Fate or King Diamond never existed Attic would have been hailed as genre originators. Alas, they are good quality retro imitators. But if the last quarter century never existed in your timezone, The Invocation can pass for something new. Just a few short steps from being a labeled a tribute band, it is actually interesting to see how The Invocation will be followed, as despite quality, the same material will not quite do next time. For now, catchy melodies and skilled musicianship grant Attic a passing, even attractive, grade.